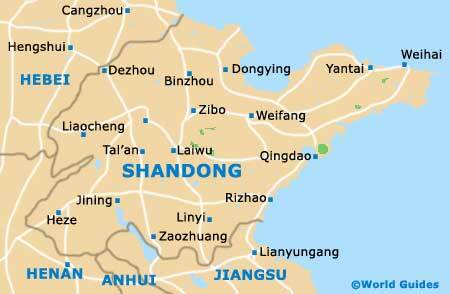 Shandong is placed at the crossroads of Chinese life in so many ways. Geographically, it is located at a meeting point between the north-south trading routes, as well as those travelling from east to west. Shandong is also the place where Taoism meets Chinese Buddhism, which in turn meets Confucianism. In this most ancient of Chinese provinces, the centre of all things religious is Mount Tai. This venerated Chinese mountain is said to have been a place of worship continuously for at least the past 3,000 years. Thousand Buddha Mountain in Jinan is renowned for the myriad of Buddha images that have peppered the hillside for hundreds of years. The Cemetery of Confucius in Qufu dates back to the 14th century - within it are the tombs of 100,000 descendents of Confucius, buried over a vast period of time, with some thought to date back over 2,000 years. Vestiges of Shandong's past stretch even further back than this, though. In 2008, major dinosaur fossil discoveries were made in the area, with over 7,500 bones unearthed from Shandong soil, including a Tyrannosaurus rex. One of Shandong's lesser-known talents is as a major wine grape producer. With over 140 wineries in the province, many a fine Cabernet Sauvignon or Merlot makes up Shandong's annual wine grape production, nearly half of which goes to satisfy Chinese demand. Shandong's coastal location certainly helps when it comes to modern trade. Today, the province is one of the wealthiest in China. Qingdao is situated on the southern shore of the Shandong Peninsula and this city is quite picturesque. The coastal setting is just one of Qingdao's many draw cards, with other highlights including temples, shopping malls, eateries and nightclubs.